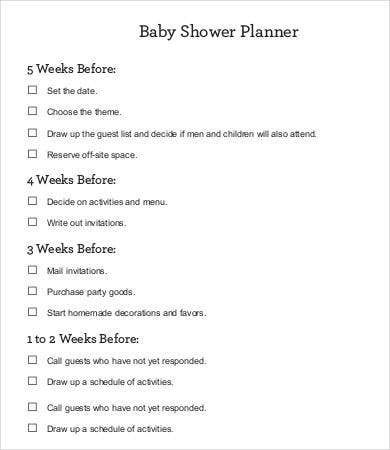 Do you need to be more organized in planning for a baby shower? Do you want to make sure that not a single table napkin goes out of sight? 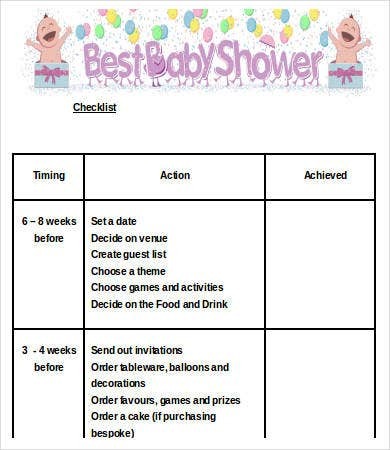 How about taking a gander at these baby shower checklist templates that we have on our website? Planning for an event could be stressful as there is the need to focus and critical thinking as to the decorations to put up on the wall, what food banquet to serve in such event, etc. It takes several components to make up a successful party. And with these templates supplied, you are a step closer to throwing the grandest baby shower ever. Baby showers are defined in two ways. One is that this party is held to celebrate the expected birth of a child. Another is this party is a way to celebrate the transformation of a woman into a mother. Although having different purposes depending on the culture, one same thing both definition entails is the giving of gifts to the expecting mother. The term shower constitutes to the giving of gifts to the expecting mother, in preparation for the arrival of her little bundle of joy. With all those months of morning sickness, unusual cravings, and back pains, it’s only right that she gets to have an affair that honors her courage through those tough times. And she deserves a celebration that everyone talks about. 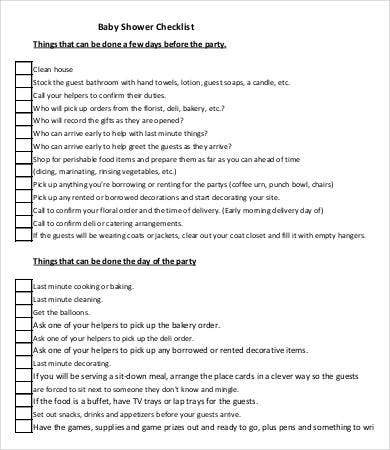 To be able to produce the most unforgettable party ever, every aspect of such event should be perfect, and what better way to be on top of things, than having a checklist on hand. 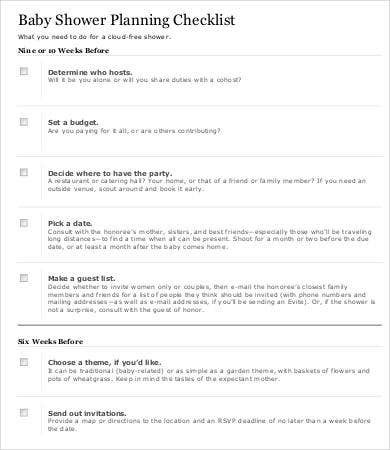 Baby Shower Budget Checklist. Like any other type of events, baby showers are no exception to having budget for them to be able to be thrown. Handle all the necessary expenditures for the party with this checklist on hand. 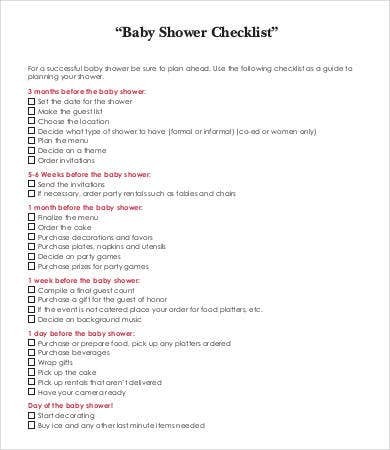 Community Baby Shower Planning Checklist. This type of event is mainly given toward those low-income expecting mothers to let them know they are appreciated. 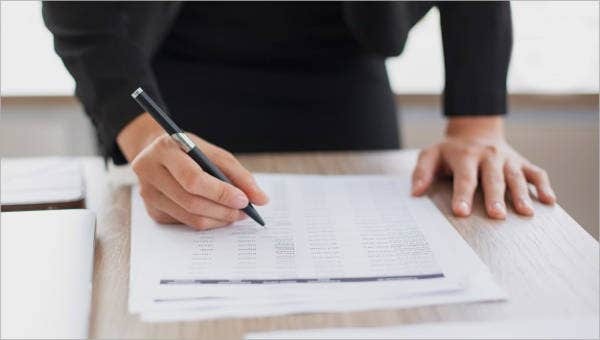 Since there will be a number of guests included in this event, it takes a lot of meticulous preparation, and this checklist can surely help you with that. 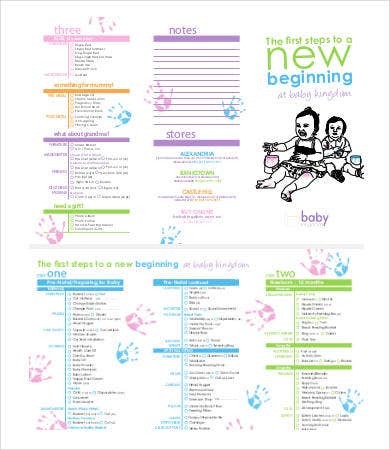 We also offer some other baby shower templates that are not included in this list such as Baby Shower Registry Checklists and Baby Shower Planning Templates. By using our templates, you can be assured that you are being provided with effective content and confident that you are doing the job correctly. These templates are accessible by visiting this site. 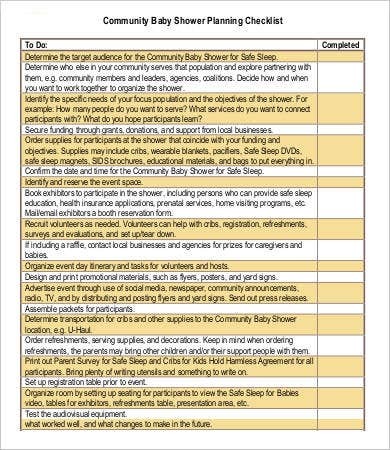 Now that you’re ready to take on the planning and organizing phase with the use of these checklists, give your friends a treat and share this link with them and help them out. 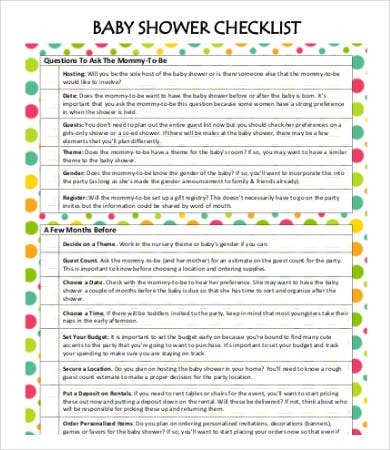 Try out now our Baby Registry Checklist Template and let them cater your needs.